+John Stater has released Blood & Treasure 2nd Edition Monsters. Blood & Treasure is an excellent OSR set of rules and I'm not just saying that because of it's heavy influence from Swords & Wizardry. 2e Monsters is a great resource for any OSR system. 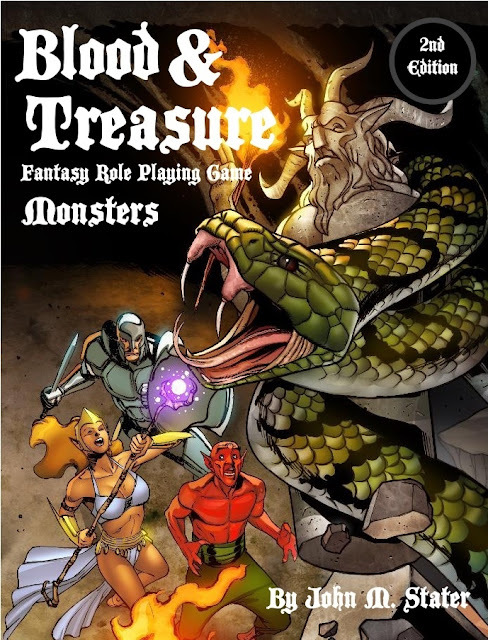 Blood & Treasure 2nd Edition Monsters is $9.99 in PDF. Blood & Treasure 2nd Edition is designed to give you years of enjoyment in just two volumes, this book and the Blood & Treasure 2nd Edition Rulebook, which features the rules, classes, spells, treasure and advice you need to create and run fantasy adventures. In this volume you get over 600 monsters drawn from folklore, fantasy and mythology. Forty of these monstrosities can be used as player characters with the help of the Blood & Treasure 2nd Edition Rulebook. You also get encounter tables with all of these monsters divided by environment and challenge level. I love the little one-page adventures mixed into the book - not just because they use my maps, but because they are awesome mixed into what is already a book of awesome.